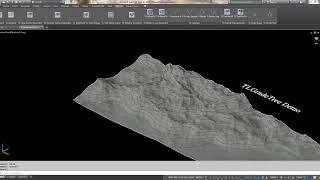 This app will take an Autodesk® Civil 3D® tin surface, a grade and a start point from the user. It'll then recursively traverse the internal tin triangles to build the "grade tree" from that point. The general case where the slope is less than the gradient at that point will result in a branching or "bifurcation". This means that after n traversed triangles there could be up to 2^n number of lines. The app supports two different modes for the grade tree generation. The default is to process each triangle only once which will traverse the surface a lot faster with the tradeoff being that not all possible branches will be explored. In civil design for example a very common application of this would be finding a path (for a road, canal etc.) downhill or uphill from a given point at a predetermined grade/slope. The app will help you to quickly visualize the domain of possible solutions after which the designer can explore different alternatives to select the most suitable one(s). (See the attached screenshots).